The balance of transit, cycling, walking, auto and telecommuting will change, and time-of-day demand patterns will shift away from the peak. Moreover, some travel will be diverted (in an unspecified way) due to capacity constraints in the area under study. 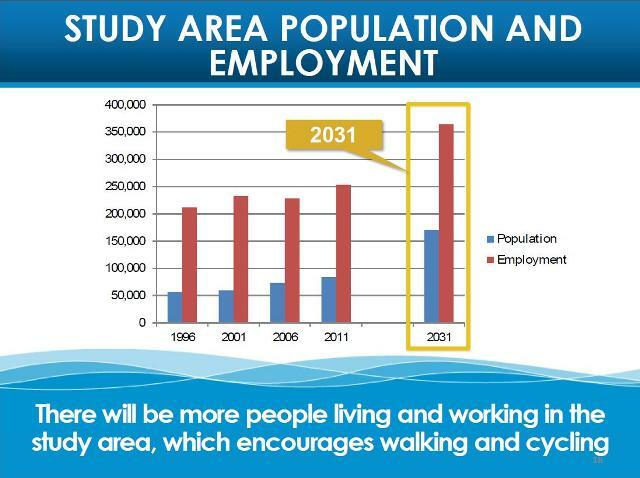 Between 2011 and 2031, population and employment in the area under study will grow dramatically with population more than doubling and employment growing by more than 50% [page 18]. Trips into the core are expected to increase by over 25% with the lion’s share projected to be on GO Transit [page 20]. The presentation does not break down the components of the transit increase, but the delta is about 40% or 70k trips in the AM Peak. That is a very substantial increase and would require at least 30k more inbound capacity in the peak hour. Where and when all of this will be provided is a mystery. Another important travel component is the trips beginning downtown but travelling outward [page 21]. The absolute volume of trips is small, roughly one seventh of inbound trips in 2006, but these are predicted to roughly double by 2031 when the counterpeak travel will be one quarter of the peak demand. 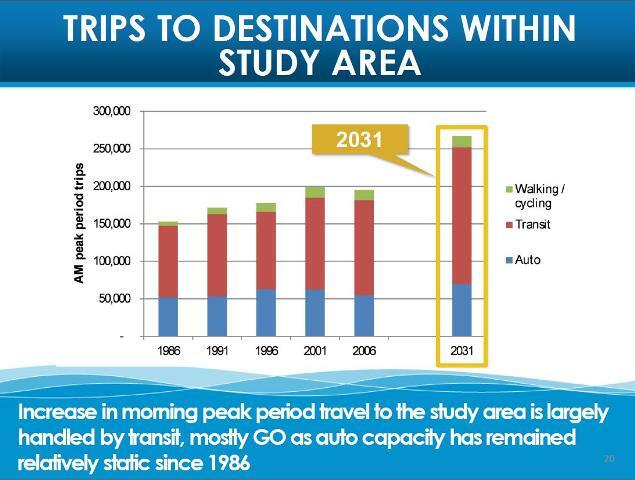 Auto and TTC travel will handle by far the majority of the increase. This has implications both for the downtown road network especially considering that all of those outbound commutes in the AM become inbound traffic in the PM when roads are generally busier. Also, this does not say much for the benefit of frequent two-way all-day service on GO and suggests either that the model is wrong, or that we are seeing the limitations of non-core service on the GO network. 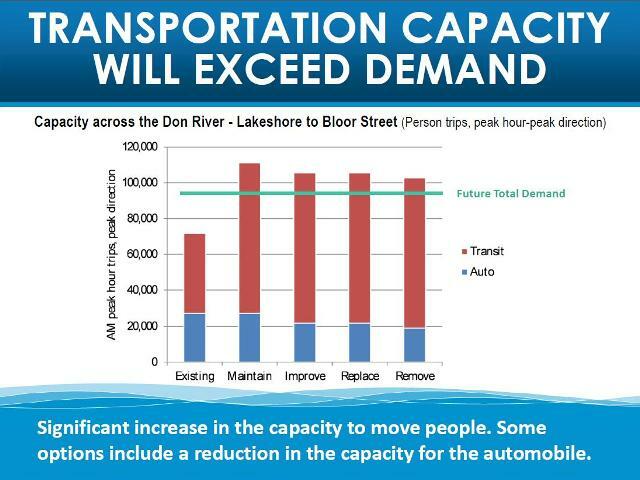 In a separate review of transportation capacity, the presentation compares network capacity with demand across a screenline at the Don River from Lake Shore to Bloor [page 67]. 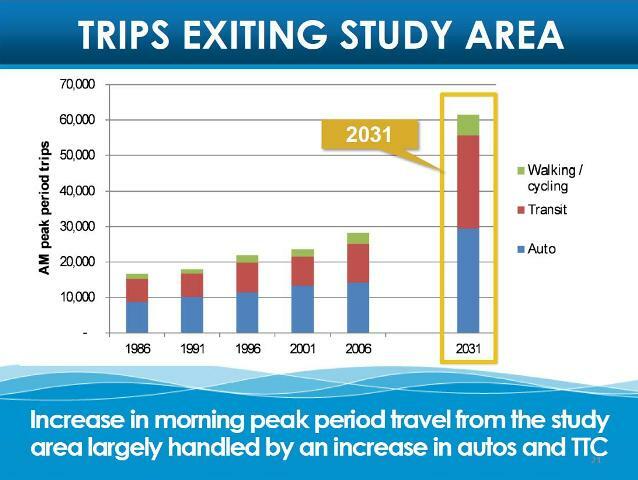 Existing peak hour demand is just over 70k split roughly 60/40 between transit and auto travel. Future total demand is projected to be over 90k. Depending on the option chosen for the expressway, the auto network capacity will either remain the same or will be decreased by amounts varying between roughly 25-30%. Transit will have to absorb all of the increased travel demand. One point worth noting in the chart above is that the greatest auto capacity is for the “maintain” option which has a wider (existing) Gardiner than the three others. Although this capacity is present today, it is not fully utilized, and it is unclear whether there is enough feeder capacity on Lake Shore East and the DVP (allowing for traffic that exits before it gets to the Gardiner) to actually use all of the capacity a “maintain” option would provide in 2031. Projected auto travel times are modelled for 2031 conditions under each scenario with the “remove” option faring the worst [page 69]. 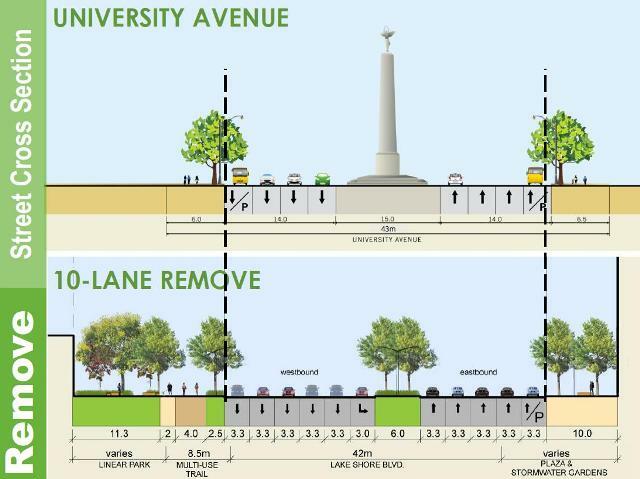 However, not mentioned in the presentation materials is the fact that the model uses the 8-lane version of the at-grade boulevard even though it shows a 10-lane version as an option. The modelling has not yet been done for the wider boulevard, but already the Toronto Star, in an editorial, has dismissed the “remove” option on the basis of the extra travel time it would entail. The more suspicious among us might think that a worst-case scenario has been proposed to ensure the “remove” option’s demise. Ten lanes may sound like a large boulevard, but it would be comparable to University Avenue [page 59]. The main difference is that the wide space taken the median on University would be narrowed to accommodate two more lanes. Also missing from the chart is a comparison with existing travel times. How much more congestion will there be thanks to greater demands on local roads leading to and from the expressway network? The cost summary [page 77] compares the four options. Highest is the “replace” option because it requires both the demolition of the existing structures and the construction of a completely new expressway. The capital cost would be $610-910m 2013$. Second highest is the “improve” option because it requires major changes to the existing structures. The two options in striking distance of each other are “maintain” and “remove” at $235m and $240-360m respectively. The net present value of operating costs of “maintain” are highest of the four at $80m with “remove” at $15m. This reflects the high cost of continued maintenance on the elevated structure versus an at-grade boulevard. Additional benefits for land value and for release of development parcels apply to all options except “maintain” because there would be no change in the physical massing of the expressway under that option. From a purely political budgeting point of view, however, increased land values are “soft” in that they do not necessarily accrue in full to the City, and they depend on development actually happening more than a decade in the future when construction is completed. The cost of whatever option is chosen must be borne now with a hope that future revenues might offset this. From an urban design standpoint, the “remove” option leaves the eastern waterfront with the best option, but at some cost to the motoring public. Exactly what this cost will be is unknown because the larger-capacity 10-lane version of the boulevard has not been modelled. Politically, the decision will come to Council in the April 2014 right in the middle of an extremely contentious election where transportation will be a central issue. The timing is poor, but City staff claim that selection of one option is needed now in order for the design and procurement process to complete before the expected demise of the existing structure. This is a rather facile excuse considering how long the matter has already been delayed thanks to pandering to Mayor Ford that stopped the study dead in its tracks for three years. I am sure that a delay beyond the 2014 election will not be fatal to the plans and could bring debate in a more rational environment, if that term can possibly be applied to Toronto. If anything, Council, the TTC and Metrolinx need to discuss this in the wider context of travel at the regional level and at the fine-grained neighbourhood level for which little provision has been made to date. This study only considers one part of core-oriented travel because that is the scope of work. Equally important are issues of subway relief and of the rail corridors to the north, northwest and west, not to mention growing downtown traffic congestion. Decisions made now will affect the character of Toronto for decades to come, and they cannot be made piecemeal one expressway, one subway, one streetcar, one bikeway, one sidewalk at a time. It is fashionable to treat downtown as adequately served and to focus attention outward on the suburbs. This is foolhardy both because it attempts to divide one part of the city from another, but also because history tells us that downtown will grow whether politicians want it to or not. This entry was posted in A Grand Plan, Downtown Relief Line, Transit, Urban Affairs, Waterfront. Bookmark the permalink. Steve I have said it before and I have said it again. Tunneling while a nice idea is not an option. With all the condos being built or about to be built there is simply no way to build a tunnel and/or ramps around their foundations. Even tearing down the Gardiner will be no simple feat given the limited clearance around condos in such places as Maple Leaf Square. Steve: You have not been paying attention, but that says something about this debate in general. We are only talking about the section of the Gardiner EAST OF JARVIS. Maple Leaf Square is nowhere near the affected area. What needs to be done and is the best option in my opinion is to tear it down and reconstruct Lakeshore Blvd. It may not be the most ideal situation politically but it is the best one practically. By tearing it down and reconstructing Lakeshore you have an opportunity for a grand boulevard like what was planned for University or along the coast in some US cities. Keeping it up for another 70 years or however long via reconstruction is also not an option. Its now apparent to most people that the Gardiner is the Chrysler Imperial of expressways. It was top of the line and the best of the best in the 50s but now its just a clunker falling apart with no hope of any sort of meaningful repairs. Reconstructing it now would be putting off the inevitable and no doubt would be a waste of money. It will probably cost less in the long run to tear it down and reconstruct Lakeshore than it will to reconstruct what is left of the Gardiner. Steve: That sounds a lot like the “remove” option. Have you read the details in the report? I’m not sure removing the Gardiner and replacing it with 10 lanes of at grade traffic is going to make the waterfront any more accessible. Would it not be easier to cross underneath the elevated highway than cross 10 more lanes of traffic? And if that’s the case, why bother demolishing the Gardiner – none of the other options would speed up traffic flow. If we wanted to make the waterfront more accessible, we should improve Queens Quay, and make sure the new condos that are built allow for publicly accessible parklands beside the lake. Steve: Part of the at grade option’s benefit is that it releases adjacent land for development that would otherwise be poisoned by the elevated. Imagine what University Avenue would look like if it were an el. People cross that street all the time in droves, yes with a two-stage crossing unless they are fleet-footed, but they cross. As for improving Queens Quay, the redesign of the western side of QQ now underway is planned for the east side too. There is already parkland along the water and more is coming. Even the non-residential buildings include public space along the water’s edge. The option that I favour is to convert the Gardiner along the lines of New York City’s High Line park. This would, of course, be much longer than the High Line, and wider as well. It would allow a cycle path for transportation, which the High Line does not. No comparison is perfect! But the costs of conversion are probably less than the demolition of the existing structure, depending upon how much park facilities are intalled. Steve: You seem to forget that part of the scheme requires maintaining transportation capacity, not simply recycling the elevated which is a huge structure. If we keep the existing structure, we still have to put a replacement road somewhere. One of the most important considerations is the removal of the existing lethal poison attacks launched by car drivers against the downtown population. As shown, this population is set to expand. Making the Gardiner car-free helps save the lives of the existing 440 people killed each year in Toronto by being poisoned by car drivers. Not to mention the $2.2 billion spent on health-care costs for people being killed and injured by being poisoned by car drivers. See page 2 this Toronto Health report. I am particularly concerned about people, particularly children, living in condos right next to the existing Gardiner. These people are not only living in the cancer death zone created by the Gardiner, but are experiencing other serious health impacts. These range from autism and ADHD in children to serious heart and lung diseases. See this report. Gee, why is it that EAs for road facilities never seem to manage to think of transit options here in Caronto? This is aided and abetted by the piecemealing of this project – I’m reasonably sure it’s a deliberate move due to the politics. And heck, transit riders pay for their passage, but why is it this limited access road is a drain on the taxpayers? We need to charge kids more for their rec programs I guess to ensure the freeway remains a free gift to the dominant automobility which dominates the core, thanks to “amanglemation” (Don Harron’s term). Why are the at-grade options both 8 and 10 lane “grand boulevards”? For completeness, shouldn’t the EA also consider a standard 4-6 lane arterial? That would leave more space for other uses and possibly open up more land to development, which is better for the city and if they actually netted out all the costs would help bolster the economic case for the remove option. It would come at a cost of some automobile capacity, but we’ve been favouring the car for decades; it’s telling that staff still don’t even think about putting emphasis on people and place rather than driving. It’s similarly telling the not one of the modal split charts includes cycling, despite its significant contribution to mobility in the downtown. Steve: Cycling is included with walking in the charts. Also, given the distances involved for most trips using this part of the Gardiner, cycling is not going to be a major alternative. 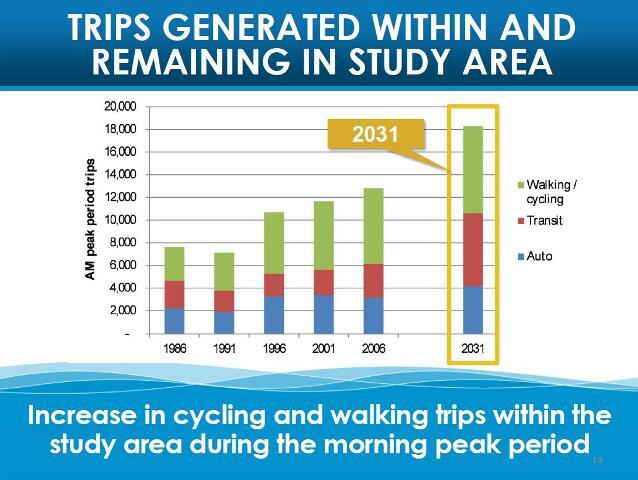 The report does make the point that the increased population downtown will lead to greater walking and cycling but this will generally apply more to “local” trips than to the distances cited in the travel time alternatives chart. Not at all. The Gardiner carries less than 6% of traffic to downtown Toronto. Other cities have successfully done highway removal projects and replaced these cancer death zones with walking, cycling and public transit. An example is the Cheonggyecheon expressway in Seoul, South Korea. An elevated expressway similar to the Gardiner, it was removed and replaced with zero additional car infrastructure in 2005. The transportation requirements were replaced with walking, cycling and public transit, and the world did not end. Indeed, Seoul became a much nicer city as a result. I predict that Toronto will become a much nicer city if we embark on a similar process, and that no sensible person would ever want to go back. The Gardiner can be repurposed for walking and cycling along the lines of New York’s High Line Park. The transit improvements needed to carry the rest of this 6% is dwarfed by the requirements for the projected growth in population and employment downtown. The requirements for transportation due to the population and employment growth downtown are addressed in The Big Move plan. I have some criticisms of this plan, but the amount of traffic displaced by the Gardiner removal is so small that it is much smaller than the projected errors in forecasting transportation demand generated by population and employment growth. 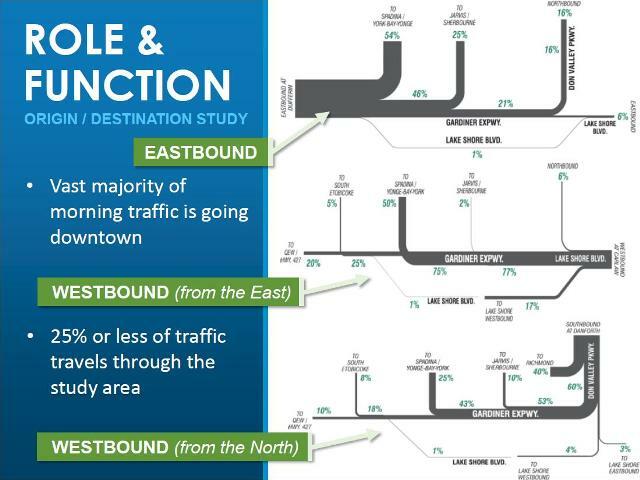 Steve: The Gardiner may represent 6% of traffic to downtown overall, but it is a higher proportion of the traffic entering from the specific direction and location of the Gardiner East. You are misusing stats to imply that removal of this road would have a minimal effect on the area through which it travels. I think it is reasonable to presume that we will not get any option that does not provide for the traffic we have today to continue into downtown will not pass Council. Can we have a discussion of options that have a fighting chance of approval? Will Rob Ford actually support any of these plans if he is re-elected? Or will he keep delaying the decision in order to “save taxpayers money” (aka screw the downtown core because it doesn’t vote for him)? If it is suggested to bury the Gardiner east of Jarvis, wouldn’t that increase public pressure to bury the entire thing? The last thing you guys need is to potentially end up spend billions on another useless tunnel while totally neglecting things like the DRL. Steve: The tunnel has been dropped from further consideration because it is too expensive. Unlike the Scarborough subway, the extra cost of a tunnel (total estimated cost about $2b) is unlikely to attract support for provincial, federal or local tax funding. Burying the expressway further west is not going to happen, and Council has already decided to rehabilitate that portion. It would be a very difficult project given the way buildings are now clustered around the structure. Rob Ford has lots of other distractions to avoid spending money on the DRL. The whole point of this article is that there is a huge increase in travel demand to downtown coming, and many on Council are so busy dreaming of their own personal subway lines that they cannot see what is happening. Decades ago when we should have provided more capacity, we were seduced by the idea that growth could be redirected to the suburbs. That didn’t work, and growth downtown is accelerating as shown in the City Planning report linked from the article. I don’t think that an option which involves tearing down part of the Gardiner is acceptable, because it will clearly make traffic congestion much worse. This is obvious whenever the Gardiner or the DVP or Lake Shore are closed for construction or some special event or due to an incident. For example, on the day in May when the DVP was closed between Bloor and Gardiner, there was massive spillover to parallel roads like Yonge or Mt Pleasant causing traffic congestion to become much worse than normal. 10 minutes additional delay is unacceptable, especially given that a long trip like Victoria Park/Finch to Union takes 50 minutes already because the traffic on the DVP is very congested. For comparison this trip takes about 55 minutes by bus 39/199 + Yonge subway regardless of time of day, but about 20 minutes by car outside rush hour if the traffic is good. This clearly shows though that building a subway that parallels the DVP along Don Mills Road, up to Finch is a high priority, it would make trips like this one faster than driving, or taking a bus and possibly the Sheppard subway/LRT or Eglinton LRT then the overcrowded Yonge Line, and ought to reduce the number of people using the east end of the Gardiner and the DVP/404. Steve: It is important to distinguish between situations where the Gardiner or Lake Shore are closed and their capacity is not replaced by other roads with one where a new road, whatever format, is provided. The eastern part of the Gardiner is a special case because it was sized for a Scarborough Expressway that was never built, and the replacement road does not have to take all of the volume that the existing capacity implies. On the O-D charts, note that a large chunk of demand on the DVP enters downtown via Richmond Street and so closing the DVP puts not just the Gardiner’s load but also Richmond Street’s load on local streets further north. Does your information contain how many vehicles and the number of people per vehicle that comes in and out? I don’t like giving all that real estate that must be given over to store an empty vehicle for eight hours so that a person could drive by himself or herself to work or home. Steve: I have asked Waterfront Toronto for a meeting to talk about the demand model in much more detail including the breakdown of users of various proposed parts of the transit network, not to mention their assumed capacities (e.g. GO expansion, streetcars, subway). The origin of these trips will also be quite illuminating because this will show the degree to which various options will or will not provide a credible, attractive alternative route. I am also fascinated to learn where all of the growth in travel to the core across the Don River screenline is coming from. These questions are at least as important as deciding which version of the Gardiner should be undertaken because they will give the larger context in which this one, comparatively small project will occur. The info I have at this point is the report linked from the article, nothing more. That’s why I need more background. If we spend a billion or whatever the cost is to replace or move the Gardiner, as opposed to keeping it, what could we get if we keep the Gardiner, and instead turn the whole area into a park, instead of condos? The problem we have is that if the Gardiner remains, we are stuck with it if the neighbouring lands are redeveloped and turned into residential neighbourhoods – and there is a cost associated with developing the lands into condos in terms of roads, sewers, environmental remediation, and so on. 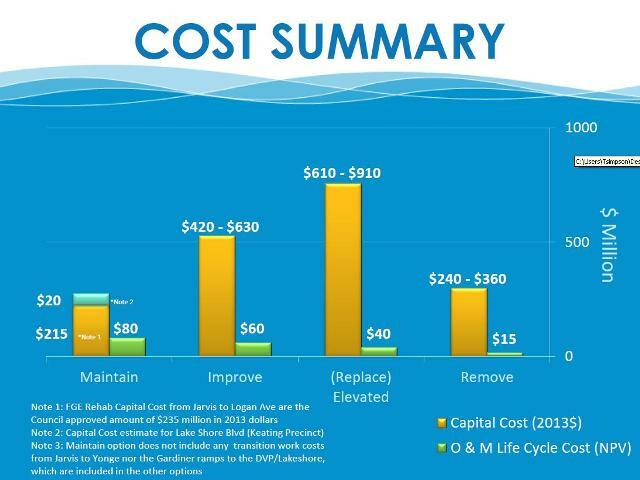 Steve: Much of this cost has already been borne by the utility work already underway in the eastern waterfront, quite literally, a “sunk” cost. So my solution is to keep the Gardiner, turn the whole area around it into a park, and this will still leave the options open for decades, or even centuries from now, to deal with this whole area. Steve: If we keep the Gardiner, we will have to spend roughly $250m to keep it from falling down. Moreover, because it is bigger than it needs to be, it “poisons” a large chunk of land underneath that would not be much use as a park other than a “hard” space like Underpass Park at the foot of River Street. I have to say that I missed the meeting this week, but I was impressed by the Rem Koolhaas vision using the former Lever Brothers site to reconfigure the whole area – it need not be as he planned, but it is certainly a great starting point and would require that the lands, bought by Great Gulf I believe, should be bought up now before it is repurposed and rezoned. Steve: I very much doubt that the City or Province have the will to spend money buying out Great Gulf’s interest in those lands. There is already a major commercial development planned on this property. Toronto lacks a central Park, or parks similar to what Chicago, and even London has (The Royal Parks) – we keep missing opportunities to create parks, or when we do, it is likely because we have little other use for the land, such as the park atop the berm in the West Donlands, which would not be as big had it not been needed for flood control. Steve: While I sympathize with your desire for parkland, it is worth remembering that a great deal of new green space will be created over coming decades by planned redevelopment of the waterfront. This will be a combination of land already in the public domain and contributions as part of site designs by developers. As for a central park, have you visited the Toronto Islands lately? There is also the network of ravines right in the middle of town. This just shows a strong need for Lakeshore electrification. Thanks for the article boss. Steve: I suspect that is included in the demand model, but without the details, one really doesn’t know. That’s why I have asked WFT for a meeting to go over this in detail. I guess one of the key questions is whether the future of eastern Gardiner can be placed in the context of a major rapid transit capacity expansion for the downtown. If we can quickly get the revenue stream to build DRL subway, plus seriously expand the GO service and make it usable for trips within 416, then it is not unreasonable to reduce the auto capacity. That will be possible if enough end-to-end auto trips get replaced, partly by bus-HRT, LRT-HRT trips (entirely by transit), and partly by car-HRT trips (driving to a transit parking plus taking HRT into downtown). If DRL remains in limbo, and GO expansion continues at a slow pace that barely keeps up with growing demand from 905 leaving no extra room for 416; then, indeed, options that do not preserve auto capacity stand no chance in the council. I very much doubt that the City or Province have the will to spend money buying out Great Gulf’s interest in those lands. There is already a major commercial development planned on this property. I was at a meeting with the Great Gulf planners a couple of weeks ago and they said, in passing, that a major announcement was coming ‘very soon’ on the Lever Brothers site and that it would include transit plans. Frankly, I could see Ford going off the deep end and pushing to restart highway construction in Toronto even though the absolute last chance to build any new highways in the city was during the deindustrialization of the railway corridors 20 years ago. Of course, it would have been an incredibly dumb idea then and you would need the Hubble Space Telescope to determine just how vastly moronic such a proposal would be now. I would like to see a nice street running east from the DVP. Does it need to look like University Ave.? Not necessarily (i.e. no boulevard down the middle) but should not be an unattractive road either, especially in anticipation of more development in the area. Steve: The Gardiner east of the DVP was taken down years ago. The section under discussion now is between the DVP and Jarvis Street where the city has not yet developed around the road, and the structure is wider than needed for the demand placed on it. With the scope of the EA being the Eastern Gardiner, it greatly skews the results. Replacement along the rail corridor, or tunneling, only have a chance if the entire Gardiner is considered as one. Then different repair options for the East and West could be made to allow the entire portion to reach the end of its service life at the same time. At that point in time, these grandiose plans may become more viable. Speaking purely aesthetically, the “boulevard” option is terrible… There’s no way a 200ft road can be made even remotely urban no matter how much render-greenery you put on it. And since much of this will run against the rail corridor, you’d have a ~400ft span of nothingness between the city and East Bayfront. If the ONLY way to handle traffic demand on a normal road is to build a 10 lane no-man’s land, that ought to be a good indication that whatever it is shouldn’t be a normal road. I think if the the remove option is to be sold, it needs to present itself as more of a City building exercise. Just trying to replace highway capacity with at grade capacity seems bizarre. The Gardiner, the DRL (I like “The Don Line”), and the Portlands / Don mouth restoration are the 3 issues that will serve to define Toronto for the next half century. For the three, my preferences are remove, yes, and mostly parkland. Positive examples of similar changes are all over North America, as are negative examples of maintaining the status quo. The duration and magnitude of these are such that they will survive any missteps of the current political group, thought they may steer things wrong to begin with. I guess that makes me an optimist. Does anyone have any costing on a “Do absolutely nothing at all” option? This would involve no future work on the FGG at all — just let it go and close the bits that get too unsafe. Make this the starting point for all the cost comparisons. Steve: It is impossible to “close bits” — it’s not as if motorists can levitate over the gaps. If piece falls down at, say, Bathurst Street, nobody goes east of there on the expressway and effectively the whole thing is closed. As for the roads underneath them, unless you can guarantee that the pieces of the Gardiner will fall on particularly deserving people, the loss of those roads won’t be a blessing either. We might barely have reopened streetcar service on Spadina just in time for a well-placed fall. And, yes, I know your post is meant in jest. Do you have any opinion of UPX electrification regarding this situation (helpful, somewhat, or not at all). The people of Toronto want to get rid of those monsters! When will Mayor Ford listen? Steve: Electrification of the UPX (and of the Georgetown corridor generally) is a necessary pre-requisite to operating more frequent service and converting that line into a rapid transit line serving the Weston corridor. It is a travesty that this is being built as a premium fare airport connector when we have so many more pressing needs for rail service in Toronto. The Jarvis to DVP connection has to stay as highway. You can’t do anything else. I would almost simply rebuild as the easiest choice. A tunnel is too short for the section, especially as it has to come out again to get to the DVP. The tunnel also will not work downtown as it is too developed so cannot be continued west. Steve, I personally don’t see the rationale for an option other then a rebuild at this point. If the whole Gardiner downtown could be rebuilt as a tunnel, then yes let’s consider other options. But a tunnel would be impractical (and too short), and the ground level option would stop the movement of local traffic from the northside to the southside between Jarvis and Parliament should the area to the south of Gardiner be redeveloped. Steve: No the ground level option would not stop traffic crossing the corridor between Jarvis and Parliament any more than University Avenue blocks Queen and King Streets. We have things called “traffic signals”. I would like to put in my two cents worth, oh, make it a nickel because the penny is gone, but I strongly suggest any option for the Gardiner Expressway but “Remove”. That “only” 10% or so of traffic is through traffic that doesn’t stop in downtown is an irrelevant argument, because the total traffic volume going through is still a high number. Add to that current and projected future growth in vehicular traffic between downtown and the Don Valley Parkway. The demand for an eastern leg of the Gardiner is very significant. That a number of cities have successfully removed expressways is also irrelevant, because that is just a generalisation. Each case has its own merits and specific situation. Common sense would tell you that a direct connection to the DVP is the best solution. Going up and around via Highway 401 is a bad alternative route, that solves nothing but creates in-town traffic. I think that the eastern leg of GE and the lower DVP is totally ugly. Concrete, noise, and smell. Somewhere in there they stuck in a river, and no one would suspect that you’re right by the lake! This would be an opportune time to trade in for a newer model. I like the idea of spreading out the gap between E/B and W/B to let the sun shine through and allow for vegetation to grow underneath. Raise the height of the expressway to reduce ground level noise and to create a more open ambiance. Rebuild, relocate, reconfigure, revamp the ramps to reduce the footprint, and for better egress & ingress. Note that any of the “keep” options are less than $1 billion. That’s lots cheaper than cancelling power generation plants or building the McCowan subway. An excellent investment in infrastructure in my opinion. My personal opinion is that the city has made a mistake by only looking at only the eastern section from Jarvis to the DVP rather than the elevated portion of the Gardiner as a whole. Even more sad is that this is not coming as part of a greater holistic examination of transportation and movement in the growing waterfront+railway+portlands area. 1) it is falling down. 3) there was no long term plan for the Gardiner anyways. B) inhospitable parks and monuments, just like University Ave north of Richmond (which is actually two north-south roads made into one). In an ideal world I would bore a large (10-12m in diameter) tunnel from Jameson under the Exhibition grounds and Lakeshore Boulevard all the way to the Don River. By making the tunnel this large there would be enough room to have 2 decks for traffic, and ramps could be configured to have a smaller footprint. The bottom section of the tunnel would be a massive drain, capable of carrying away water from flash floods, and of course the tunnel would last 100 years. I would extend Fleet Street to Dufferin and reconfigure the streetcar access to the Ex Grounds, connecting the Exhibition and Dufferin loops. And of course I could do all of this because private developers will pay hugely for the the opportunity to build along a grand “Lakeshore Avenue” that is worthy of the name. I will now take a moment to figure out the line between real ideas and sarcasm in what I have written above. Steve: The decision on the Gardiner from Jarvis west is long past. Indeed, even doing anything about this chunk of the Gardiner was put on hold three years ago by the Ford administration and has only come forward now because the “do nothing” option is no longer viable given the state of the expressway. Major repairs will work their way east across the city in coming years reaching the Jarvis-to-Don segment by the time whatever is approved from the EA process has gone through detailed design and tendering. As for your humourous suggestions, I only wish I didn’t believe some bright spark (well maybe not quite so bright) at Council would propose them. Downtown may “have too many subways”, but it can never have enough expressways. Horatio Alger, I don’t agree that a 200ft wide street just can’t be made urban. The Avenue des Champs-Élysées in Paris is 230ft wide, and is pretty much the epitome of the beautiful urban avenue. Obviously it has to be done carefully, but there is no reason that a 200ft wide street cannot be urban. Creating a “10-lane boulevard” means a staged crossing for pedestrians (which is already in place at Sherbourne, I note) with a green phase of at least 24 seconds (given 18.5m of 5+1 lanes on each inbound side of the intersection, that’s 8 seconds of “walk” followed by a 16 second count-down, based on minimum provincial standards). By contrast, Sherbourne’s green phase is currently only 18 seconds. That suggests that Lakeshore traffic, in order to preserve the current throughput rate, would need to have greens that are also 33% longer. Which means that pedestrians, if their arrival is badly timed, may require upwards of 5 minutes to make a simple road crossing. Plus, with infrequent signals and staged crossings, is a 6m median really wide enough for pedestrians to wait comfortably for 2 minutes for a green? (Most people seem to try to stand at least 1m from the curb, given heavy trucks moving by at up to 60km/h.) And given fewer, longer lights, is it enough space to safely accommodate all stranded pedestrians on a busy day? I don’t understand people who complain about the Gardiner “blocking the city off from the lake” and don’t talk about Lakeshore. The Gardiner I can ignore; it’s Lakeshore that (already) makes the walk between Queens Quay and north of the railway corridor miserable. And the boulevard proposal makes it at least twice as bad. For the “remove” option, I can’t seem to find anything relating to how it would connect back to the DVP. If they are thinking an at-grade intersection we could be looking at another Allen Rd.-Eglinton Ave. traffic jam. Maybe modify the current west to north ramps? Steve: The at grade road would ramp up to existing structures at Jarvis and east of Parliament. The decision on the Gardiner from Jarvis west is long past. Indeed, even doing anything about this chunk of the Gardiner was put on hold three years ago by the Ford administration and has only come forward now because the “do nothing” option is no longer viable given the state of the expressway. Major repairs will work their way east across the city in coming years reaching the Jarvis-to-Don segment by the time whatever is approved from the EA process has gone through detailed design and tendering. Which suggests that Council will continue the ‘safe’ option and vote to just ‘repair’ the Gardiner for the current “the-Gardiner-is-falling-apart-oh-what-shall-we-do” period and give the proverbial can (or, dare I say, football) a good swift kick down the line. Do note that the trajectory of the proverbial can/football, upon being kicked, will match the trajectory of the “Don River Flyover” that the “Remove” option will leave us with. This could be a new sports festival for Toronto (“The Kick Off”) which could generate billions in revenue and create thousands of jobs. I honestly haven’t found the line yet. Toronto’s transportation foolishness is going beyond amusing now. I can see that the Gardiner will most likely be part of my future and my son’s future, while the DRL won’t be. Steve: Swan Boats are a proud form of transit and deserve to go on the upper level of any new facility. Otherwise Swan Boat patrons will feel they are being forced to take a third class transit system. Tearing down the East Gardiner extension was an enormous improvement. You never see traffic backed up. It’s wonderful to see so many cyclists. And what an improvement visually! Simply put, the Gardiner Expressway, like all overhead expressways (The Embarcadero in San Francisco comes to mind) is ugly. Tear it down. I wholeheartedly agree that 8 to 10 lanes of traffic is hardly desirable, as both a pedestrian and cyclist, but more than offset by getting rid of all that visual clutter. I look forward to renderings. i haven’t looked at the latest EA, but did they look at 2 one-way 5-lane roads instead of one 10 lane monster road? Steve: No, and I suspect that the reason is that there isn’t room to have two separate roads with something between them. There would also be alignment problems for the two directions to connect with the existing elevated structures at each end. The traffic on Lakehsore at Leslie street is bad during evening rush hour, and once the new Ashbridges lrt barns are open, it will become a major disaster area. Making us wish we had kept the Gardiner and had the LRTs cut underneath it somewhere to the west of Leslie. Steve: While I have issues with the Leslie Barns, one thing it will not do is to contribute to peak period congestion. Vehicles will run to and from the carhouse before and after the peak, but not during. Similarly in the morning, most of the cars will be out before the rush hour traffic is at its worst, and they won’t start coming back until after 9am. Andrew is wrong that reducing car capacity necessarily makes traffic worse. What we’ve seen around the world again and again when capacity changes is that traffic is crazy for a couple of days, then people get used to it and either change their route, change their mode, or change their plans and things settle back down to normal despite the change. There’s absolutely no reason not to replace that stretch of the Gardiner with a normal arterial and try to get some city building value out of what otherwise would be valuable real-estate, except the usual scaremongering that happens every time any place in the world tries to shift even slightly away from pandering to the automobile. Whether it’s road diets, congestion charges, or removing outdated urban freeways, people always kick up a fuss beforehand and then realize how much better things are after the changes are made. I have not heard a single story about an urban highway removal where people were still upset once they saw how much better things could be. It takes some courage to get there, but it’s completely worth it. That would be turning the Gardiner into a regular road. This would be foolish in my opinion Steve. Sorry, but we should keep it as a highway, especially as it can be busy during the rush hour. I have seen the Gardiner, and been on it, during the rush hour and it would be absolutely foolish to do anything but retain it as a highway. Steve: Well that’s your opinion and you’re entitled to it. Remove it. Don’t replace it. 40% of the traffic gets off at Richmond. Did I mention that 40% of the traffic gets off at Richmond? Make this the main terminus of the Don Valley Parkway, with an additional exit to Lake Shore Blvd. Or, additional: Add a GO Transit station to the Richmond Hill line at this point and run frequent shuttles to Union Station. Alternate or additional: add a giant parking garage with direct ramps near the point where the DVP crosses under the railway corridor, and link this to the Downtown Relief Line. Alternate or additional: Add a GO Transit station along the Lakeshore Line here, fed by this parking garage, with frequent service. In short, there’s no reason to permit this much car capacity into the core of downtown. You can bet that most of this is commuters. Do what Boston did at Alewife: intercept it outside of town and put people on high-capacity transit. Then you don’t need to replace the eastern end of the Gardiner with… anything. But that would require Thinking Big. Sigh. Steve: Big thinking includes no parking garages. They are a blight on the landscape and they perpetuate the idea that driving is the primary way to access the city. The bottom of the DVP is an area where major redevelopment is planned, and the last thing we need there is a whacking great garage. Intercept these folks further north. Anyone living south of Lawrence close to the DVP and headed towards anywhere west of the core, including going to Oakville or the QEW, needs to use this section, and will never use the 401. The study indicates an extra 5 minutes if the Gardiner is torn down… ya, right, maybe at some times of the day, but not in rush hour. Steve: And as I have already pointed out, the “extra” time is a function of the 8-lane version of the replacement. What is missing is info on the travel times with the extra capacity of the 10-lane version. Also, of course, we are only talking about the segment from the Don River to Jarvis Street, not all the way to the QEW. While I have issues with the Leslie Barns, one thing it will not do is to contribute to peak period congestion. Vehicles will run to and from the carhouse before and after the peak, but not during. Steve: And the last time I looked, the streetcars will cross Lakeshore, not run along it. This issue is badly overblown. Politically, the decision will come to Council in the April 2014 right in the middle of an extremely contentious election where transportation will be a central issue. Exactly the issue Steve which from a realistic point of view is why the remove option is not practical. It will likely have the greatest impact on the motorist (and most likely negative – it will take a lot to convince me or any ‘pro car’ person why a ‘regular’ road will be better than a highway for moving all those cars) plus the car demographic is not going to vote for anyone who is likely to make their life worse. I do agree that the Gardiner is an eyesore, and should be been tunnelled from day one. But it is there and people do, and will continue to, require the Gardiner to get around. Cars are, even if we ‘transit folk’ do not like it, are part of the transportation system and do need to be respected as well. I prefer transit, but there are times when I have to use a car because either the transportation system does not go where I need to go (or when I need to go) or because it is simply not practical for me to use transit. Frequently … it’s busy, but far better than driving west from Leslie to Carlaw at 8am. Westbound Lakeshore seem to be the bottleneck at AM peak. Eastbound traffic seems to be constrained on the Gardiner in the PM. I often find Humber to Dufferin on the Gardiner worse than Carlaw to Leslie at 6 pm. And it seems better now that they knocked down the Gardiner from Carlaw to Leslie, than it used to be, with all the traffic trying to get down the old ramp from the Gardiner at Leslie! But how does this relate to streetcars? Very few come off-service until almost 7 pm … and there’s nothing stopping them putting the ones coming into the yard first at Russell instead of Leslie. Looking at [Toronto’s transportation volume map], traffic that uses the study area (Gardiner and Lake Shore, Jarvis to Don Roadway), while it pales in comparison to the DVP north of Bloor and the Gardiner west of Spadina, is still substantial. The current volumes (3K vehicles per hour) are comparable to traffic handled by University Ave and Jarvis St. combined. It can be easily absorbed by a four lane expressway and a four lane boulevard but even a 10 lane boulevard will lead to backups similar to the bottom of the Allen on both the DVP and Gardiner for 16 hours a day. This needs to be addressed but not by beefing up the road but by reducing the amount of traffic coming in and through. While it’s worth to request the study team to use a 9-10 lane boulevard (no curb lane is needed for the westbound direction as no properties will fit between the rail corridor and the new avenue) and analyze the traffic impact, the main constraint on its the capacity are half a dozen traffic lights. Those will need to be long to help the pedestrians to cross safely. In fact, fewer through lanes might even speed up the traffic since it will get longer green time. Personally, I would prefer 3 westbound lanes and 4 eastbound lanes, the curb lane used for loading and property access. Any road wider than that will have an adverse effect on quality of life in the area. Steve: There would only be two crossings: Parliament and Sherbourne Streets, plus possibly Jarvis depending on the design of the transition from the surface road back to the elevated west of Jarvis. However, I agree that the behaviour of any intersections must be taken into account in the study. A roundabout at the Don Roadway might be worth looking into as well. It can reduce the backup of traffic on the DVP and Westbound Lakeshore. The bigger question, should the downtown auto capacity be reduced upon the implementation of the Big Move? At the moment the study area is not served by rapid transit. All Eastern waterfront east of Sherbourne either lacks transit completely or is served by an erratic 504 which forces people to take their car if they want to get to work at a reasonable time. Parking is still cheap in the area. The complete implementation of the Big Move will include at least two DRL stations in the area, a station on the Richmond Hill line with frequent service and a possible station on the Lakeshore super GO. Local transit will include the Cherry Broadview streetcar, the QQ East LRT and improved service on the King car. 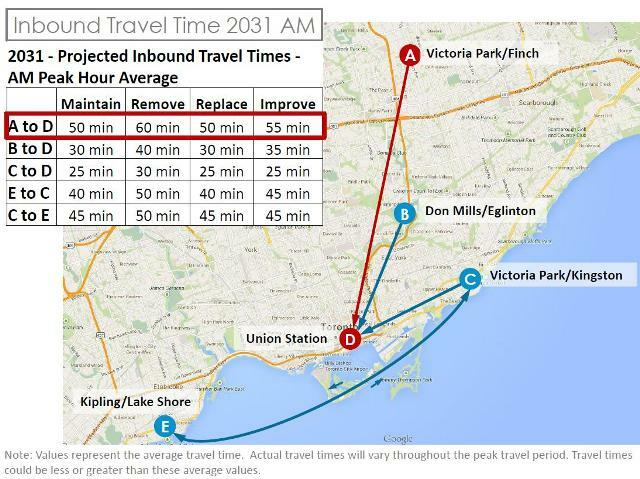 In another words, transit will be totally able to get people to anywhere in the area under 60 minutes from Vic Park and Finch (the example used in the study), very competitive to driving. Therefore the council will have to make a decision, should East Waterfront be a place to live, work and play or travel through at highway speeds? Inconvenience to motorists is guaranteed no matter which option is chosen (that includes years of road closures even for the maintain option). If we wish to help people that choose to drive no matter what transit improvements are in place, congestion charges on both DVP and Gardiner have to be considered. That will reduce traffic if tolls are high enough and raise funds needed for maintaining the roads, operating the TTC and speeding up the implementation of the Toronto portion of the Big Move. Everyone wins, the drivers get an open road with reduced traffic, the city gets a steady source of financing, downtown residents get space on their streets. Don’t wanna pay the toll? Take the train. Generally speaking I think the idea of removing barriers to the waterfront is grounds for good policy. However, Boston’s experience should provide a cautionary tale for the extent of any projected costs and benefits that may be realized from such a project. My main concern with bringing down the Gardiner would be that the government must couple the tear down with corresponding improvements to commuter transportation system to mitigate any negative effects that would be experienced by persons that use the existing highway. Having followed this discussion for some time I fear that the current approach is structured in a way that will exacerbate the existing socio-political cleavages that are already very pronounced in the region. It is likely that any plan no matter how good will likely fail if it does not include a clear well defined transportation strategy that will ensure that those who use the existing structure will not suffer a decline in quality of life should the Gardener in fact be removed.